Go to Facebook and Like Serendipty Beads to keep up with Give Aways and what is happening at Serendipity. Come in store and have a free hot cup of something, sit down at my table and have a flick through the many magazines and beading books I have in my studio. During my beading journey I have taken out many books from the library re beading and jewellery along wth cardmaking magazines. 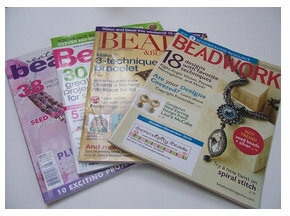 I have been frustrated at the lack of bead weaving magazines (none) and books available to have a look at. Most of my magazines and books have been purchased from Australia or the USA either by subsription or as a one off book. As I know you will all love looking at these they are available to you to take home for a period of two weeks for a small fee. (obviously this is my personal library but I am happy to share).